After commenting on a post by Brad, I was contacted by Josh Larson of madKast, asking if I’d like to try their widget. As background, madKast is one of the offspring of the TechStars incubator program, which was founded by David Cohen. Coincidentally, I’d just finished "All Drive, No Vision", the story of David’s first startup, which I found fascinating, and deserves a blog entry of its own. It doesn’t seem to slow down the loading of my blog, which is a major problem with a lot of other widgets, and it doesn’t add much visual clutter. 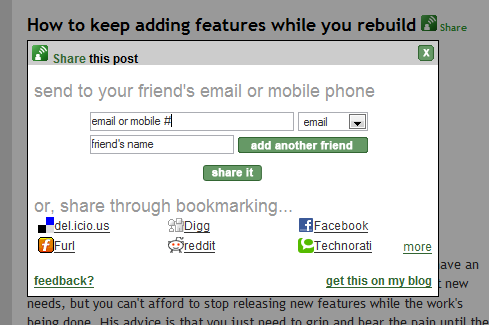 I really like the widget’s focus, it’s aimed at doing a great job at helping users share blog links, and succeeds. I’m planning on keeping the widget on my blog, it seems like it will improve my reader’s experience. Congratulations to Josh and the team, it’s a great product! Site statistics. I’d love to know which posts users were sharing, and anything that offers usage feedback is like catnip for bloggers, so it seems like it would help spread the widget. Anonymous would be fine for me if there’s any privacy concerns. Maybe the most popular shared links could be shown on the madKast main page? Those would all be great incentives for sites to install it. Client-based. There’s a small but vocal minority of people who like to share links they find, and a larger group of passive consumers. This is my bias towards client-based solutions showing, but I think it could be a big win to persuade the avid link-sharers to install a Firefox extension (or IE BHO) that implemented the same functionality. That’s drifting more towards a delicious or digg model obviously, but it seems an obvious reuse of the existing infrastructure. Customization. I’d love to be able to alter the appearance and positioning of the icon, and maybe even the look of the dialog that appears, maybe using some CSS options. Funhouse Photo User Count: 665 total, 83 active. Last night I implemented Ajax loading for the photo pages, so that the user immediately sees a loading page, and then the photos are created synchronously on the server. The result is that the photos appear quickly, and there’s no painful full-page reloading as there was with the old method. I’m hoping this will increase the growth rate. Now I’ve got this going, I really need to add a few more effects to draw people in. Thanks for your cool posts. I have been trying out u’r recommendations and they are way cool.